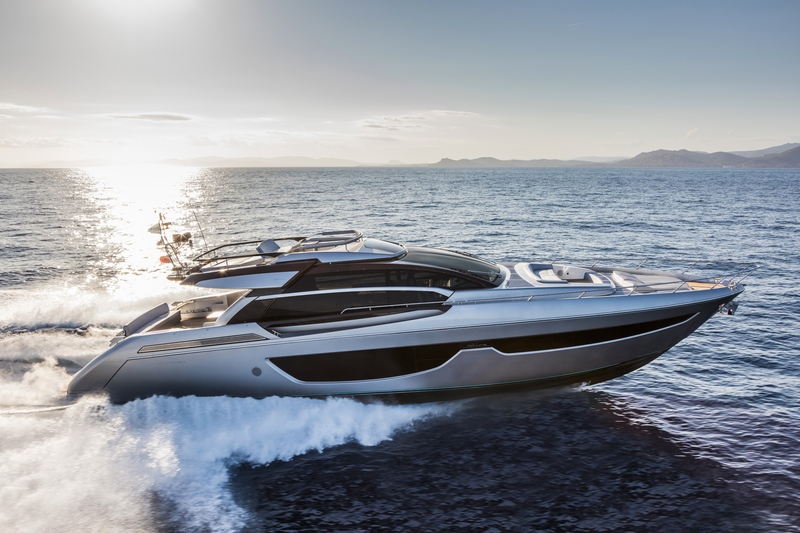 Built in 2019 by famous Italian shipyard Riva (part of the Ferretti Group), the 23.3m/76.3ft luxury yacht DEMA is a fast planing vessel constructed with a GRP hull and superstructure, resulting in a lightweight draft for navigating in shallow waterways. The sleek silvery hull makes extensive use of glazing for brightly lit cabins with uninterrupted views of the scenery. The naval architecture and interior design is the work of Officina Italiana Design, and the accommodation sleeps up to six guests over three en-suite cabins, with room for up to 16 pax while cruising and an expert crew of two to take care of all details on board. The main deck aft provides a generous shaded cockpit providing a corner sofa and table to starboard and a staircase to port leading to the flybridge. The main deck stern is lined with a plush curving sofa for drinks together while enjoying panoramic views. The bow offers a cost C-shaped sofa for outdoor lounging, while the bow is fitted with a spongy sun pad. The flybridge above has a convertible sunbed-sofa in the centre, and another sofa follows the shape of the stern. The lower deck is dedicated to the guest and crew accommodation, with room in the stern for water toys storage. On the main deck, the helm station is placed forward to starboard and opposite there is an L-shaped sofa and raised dining table for group meals that enjoy the sunshine and scenery within the air-conditioned surroundings. Behind, there is a cabinet with a pop-up 40" LED TV and another chaise-sofa and coffee table to starboard. A pair of MAN 1,800 HP engines produces an excellent top speed of 37 knots with a cruising speed of 32 knots. The accommodation sleeps up to 6 guests over 3 en-suite cabins: 1 Master suite, 1 VIP stateroom and 1 twin cabin. ~ The Master suite is placed amidships on the lower deck to take advantage of the full beam, and the interior is furnished with a king-sized bed, a 32" LED TV, a port-side bay window-style sofa, and a desk to starboard. The forward en-suite bathroom has his-and-hers sinks, a toilet and bidet and a shower with a bench. ~ The VIP stateroom in the bow has great natural lighting from both sides. The forward wall is fitted with a 22" LED TV and there is also a large bathroom with a sink, toilet and shower with a bench. ~ The twin cabin is placed to starboard of the Master en-suite and has a forward bathroom with sink, toilet and shower. ~ The crew of 2 will provide a professional and discreet service for all guests on board.